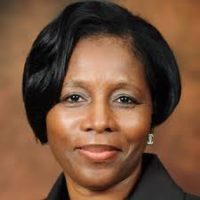 Ayanda Dlodlo is a South African politician and was appointed as Minister of Public Service and Administration on 27 February 2018. She was the Minister of Home Affairs of the Republic of South Africa from 17 October 2017 till 26 February 2018. Ayanda is a member of the African National Congress (ANC) and also a Member of Parliament. She was born on the 22nd of May 1963. As of 2018, she is 55 years old. Her husband was Theophilus Dlodlo who was killed in May 1987. She has a son called Thabang Mnisi. Public Service and Administration Minister Ayanda Dlodlo has put smiles on some ANC members’ faces after she confirmed that the public service would not be retrenching employees anytime soon. Dlodlo appeared on both the SABC and eNCA on Friday morning to discuss the public sector wage bill after Wednesday’s budget speech by Finance Minister Tito Mboweni. She defied public criticism that the public service is bloated, saying Mboweni agreed that government had a high wage bill issue but not a “bloated” public service one. “We must manage the high wage bill, and granting early retirement to those who request it is one of the options,” she said in a tweet. The ANC has been slated by the Democratic Alliance, who claimed the government was bloated with ANC deployees not adding value, and it urgently needed intervention. DA leader Mmusi Maimane once said the country’s finances were in trouble because the ANC had built a bloated state. “We need fundamental reform. Sell SAA, open Eskom up for competition by allowing other power producers, reduce cabinet, focus on city-led economic development. We need reform,” Maimane tweeted in July last year. The early retirement option would mean the government has space to recruit young people into the public service. This meant the government would also tackle the challenge of high youth unemployment. The early retirement program would be very well managed, according to Dlodlo, and would not lead to “a brain drain”, meaning a request for early retirement would be considered with due regard given to the skill needs of each department. Scarce skills such as doctors and teachers would not be lost. She said innovative ways were currently being considered to improve service and contain salary budgets.